SJK or (Swiss Java Knife) was my secret weapon for firefighting various types of performance problems for long time. A new version of SJK was released not too long ago and it contains а bunch of new and powerful features I would like to highlight. SJK is living it's name by bundling a number of tool into single executable jar. Though, ttop is a likely single most commonly used tool under SJK roof. ttop is a kind top for threads of JVM process. Besides CPU usage counter (provided by OS) and allocation rate (tracked by JVM), a new thread contention metrics was introduced in recent SJK release. Thread contention metrics are calculated by JVM, which counts and times when Java threads enters into BLOCKED or WAITING state. If enabled, SJK is using these metrics to display rates and percentage of time spent in either state. An important fact about these metrics is - CPU time + WAITING + BLOCKED should be 100% in ideal world. system may starve on CPU resource and thread is waiting for CPU core on OS level (which is also not accounted by JVM). Contention monitoring is not enabled by default, use -c flag with ttop command to enabled it. SJK was able to produce flame graphs for sometime already. Though, old flame graphs were generated as svg with limited interactivity. filtering data by thread state (if state information is available). HTML5 report is 100% self contained file with no dependencies, it can sent it by email and open on any machine. Here is an example of new flame graph you can play right now. 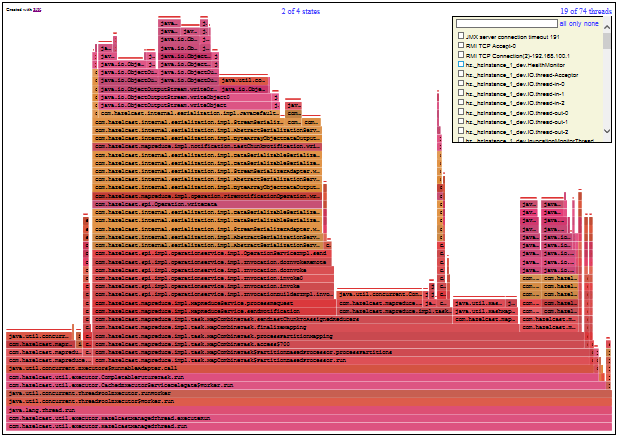 New flame command is used to generate HTML5 flame graphs. SJK is accepting a number of input data formats for thread sampling data, which is used for flame graphs and other types of performance analysis.